Dubai is a city of two halves. It boasts a fascinating old centre dotted with traditional coral-stone souks and picturesque minarets, best appreciated during a ride across the Dubai Creek. Board a traditional ferry (abra) and take in the view as it weaves between hundreds of old wooden dhows that still ply the Gulf. But the modern city has plenty of showstoppers too. Standout attractions include the sail-shaped Burj Al Arab Jumeirah seven-star hotel (admire its dazzling interior over tea in the atrium) and the cloud-capped Burj Khalifa – the world’s tallest building at more than 828m high – with jaw-dropping views from its observation decks. Dubai’s foodie scene runs the gamut from modest, inexpensive Arabian cafés and no-frills curry houses through to opulent fine-dining venues complete with extravagant decor. In the old city, Aroos Damascus provides lively streetside dining and great Lebanese food at bargain prices. More upscale venues include the incurably romantic Pai Thai at the heart of the Arabian-themed Madinat Jumeirah Resort and cutting-edge contemporary Indian dining at Indego by Michelin-starred chef Vineet Bhatia. Haggle your way through the traditional souks of the old city centre, including the glittering Gold Souk, with jewellery galore, and the aromatic Spice Souk, stacked high with piles of frankincense, rose petals and other fragrant exotica. 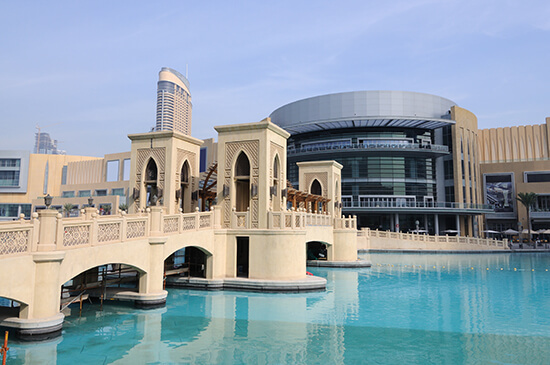 Or head to one of the modern city’s mega-malls, such as the gargantuan Dubai Mall, the upmarket Mall of the Emirates (complete with an indoor ski slope) or the surreal Ibn Battuta Mall, where quirky themed decor pays homage to the travels of the legendary Moroccan adventurer after whom the mall is named. Many of Dubai’s great beaches are accessible only to guests at upmarket hotels, although there’s a superb stretch of free beach in Dubai Marina, boasting a huge swathe of gorgeous white sand to relax on along with plenty of water sports, myriad cafés and sweeping views of southern Dubai’s dramatic skyscrapers. 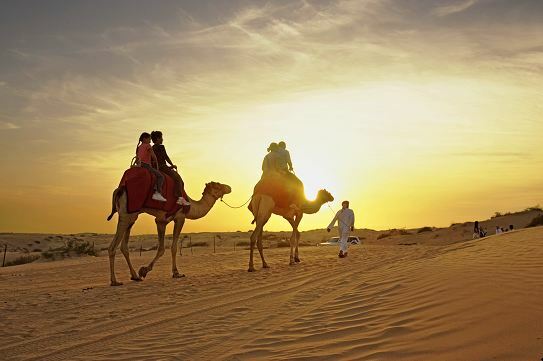 Get away from the city on one of the popular sunset safaris, offering the chance to ride across vast dunes as dusk envelops the desert, followed by an evening under the stars at a Bedouin-style encampment with traditional food, belly dancing, henna painting and the occasional camel. Situated on the western crescent of Dubai’s iconic Palm Jumeirah, the five-star Jumeirah Zabeel Saray hotel makes a sumptuous choice of accommodation in the ‘City of Gold’, with Arabian Renaissance-style interiors throughout. Go for a dip in the magnificent 59m infinity pool overlooking the Arabian Gulf, or in the warm waters off the pristine private beach, and relax at the award-winning Talise Ottoman Spa, which offers hammam and treatment packages in abundance. To add a stopover or a longer stay in Dubai, call our Experts on 0800 258 5773.